Saudi Health Interview Survey is a cross-sectional national multistage survey of individuals aged 15 years or older. A total of 10,735 participants completed a health questionnaire and were invited to the local health clinics for biomedical exams. 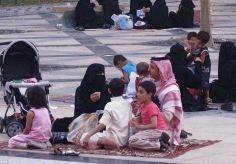 1,745,532 (13.4 %) Saudis aged 15 years or older have diabetes. Among those, 57.8, 20.2, 16.6, and 5.4 % are undiagnosed, treated uncontrolled, treated controlled, and untreated, respectively. Males, older individuals, and those who were previously diagnosed with hypertension or hypercholesterolemia were more likely to be diabetic. Our findings call for increased awareness of pre-diabetes, diabetes, and undiagnosed diabetes in KSA. Combatting diabetes and other non-communicable diseases should be the task of the Ministry of Health and other ministries as well, to offer a comprehensive socio-cultural approach to fighting this epidemic.